Initial police investigations led to a positive conclusion: the purchase is 100% kosher. The IDF commander of the Hebron region had no objection to a Jewish presence in the house; to the contrary, he regarded the site as a strategic asset and gave his blessings to the purchase. However, members of the government, with then Defense Minister Amir Peretz at the forefront, demanded a solution to the new “Jewish problem” in Hebron. They didn’t have long to wait. A recently invented military order, never before implemented, was pulled off the shelves: “An order against bothering usage.” Hearings, based on this strange military order, began before a military appeals panel of three judges. Twenty nine days after the Hebron community claimed the building, a Hebron Arab named Rajbi issued a claim in the Israeli Supreme court, saying that the building belonged to him and that he had not sold it to the Hebron Jewish community. (His claim was filed while he was being held in a Palestinian authority jail in Jericho. His lawyers claimed he was being held for his own protection). The police were unable to complete their investigation within 45 days; they delayed their report to the court four times. A week and a half ago the prosecutor’s office finally reported back to the Supreme Court: following conclusion of the police investigation, the prosecutor’s office would support eviction of the Jews from Beit HaShalom, on the basis of the “squatters’ eviction law.’ However, they gave absolutely no reason for this conclusion. They made no mention of falsified documents, or of a fraudulent purchase. The impression left with the media was that the purchase was illegal, but no proof was offered. Yet, several hours later Hebron’s attorney received an eviction notice stating that the building would be evacuated within 48 hours based on the “squatters’ eviction law”, during which time the decision could be appealed. In other words, the sale of the building was legitimate, the documents are all in order, yet Jews still cannot live there. Why? Quite simply: Annapolitics. Annapolitics has nothing to do with justice, fairness, objectivity, or basic human rights. According to various high-level sources, Israel, pre-Annapolis, promised the Arabs and Bush that the Jewish residents of Beit HaShalom would be expelled from the building in the very near future. The fact that the purchase was legal is irrelevant. The only factor which matters is appeasement: appeasing our enemies on both sides of the line: the Americans and the Arabs. Make no mistake. The Americans are enemies. Under the leadership of Rice and Bush (in that order) the United States has been transformed into one of Israel’s most dangerous foes. The policies being forced down our throats, including abandonment of virtually all of Judea and Samaria, as well as Jerusalem, is only the beginning. The Golan Heights are not far behind. Why? It’s likely that Rice and Bush are placing their history- legacy hopes on a miraculous Middle East peace accord. However, there’s another reason – this is the price America is demanding of Israel to take care of the Iranian nuclear threat. But for Israel, this is like asking which do you prefer, to be murdered or assisted suicide?! Israel’s leaders aren’t overly righteous either. Olmert: the results of 1967 will be changed significantly, and Foreign Secretary Tzippy Livni: ‘it’s no longer Arab against Jew, rather moderate against extremist.’ These words leave little doubt as to the direction they are taking and how we, the residents of Judea and Samaria, will be defined (in one breath with Hamas and Hizballah). What can we pray for? Also very simple. The lynchpin of this entire absurdity is Abu Mazen – Mahmoud Abbas, ‘president’ of the PA. If Olmert goes, Tzippy, Barak and Bibi are waiting in the wings. Bibi – his reaction wasn’t one of horror, rather that we conceded too much without getting anything in return. 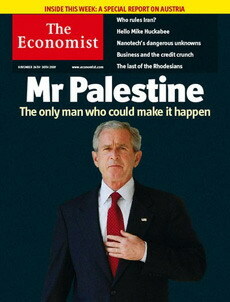 And when Bush concludes his presidency, who knows who will replace him. But if Abu Mazen should disappear from the scene, the deal’s off. So, maybe we should pray that Hamas get to him ASAP. They know how to do the job and he’s more than likely in their sights. Why should the Jews of Hebron have to be the first sacrifice of Annapolitics? I am one American Christian who not only hopes for the return of all Jewish lands to the Jewish people,but know that one way or the other, what God promised will be returned to you and the other rightful owners. I feel that Bush and Rice, simply need to study the Old Testament and New, for that matter, to understand, that God does not renege on His promises. I'd like to point out that the armored vehicles and tanks sitting outside your door protecting you and your family are paid for by the American “enemy”. As a father and grandfather, one would think that you'd want to ensure a safe and prosperous future for them. Rather, you are using them as pawns to fulfill YOUR agenda while guaranteeing them a life of violence and hardship. How selfish can you be? You disgust me.